Easy gluten free pasta casserole is made with penne pasta, lean ground beef and ricotta cheese. This filling and delicious casserole will feed a crowd or provide a small family with lots of leftovers! 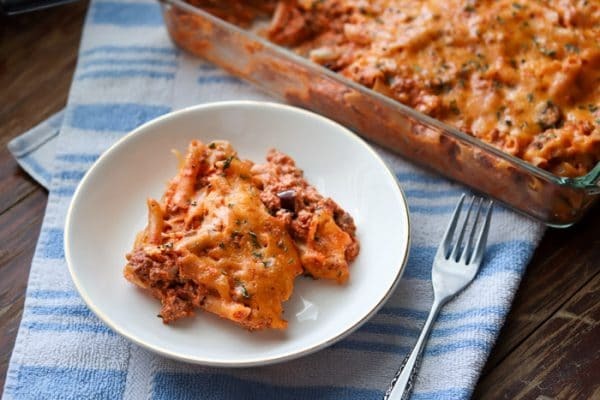 You only need 6 simple ingredients for this recipe – gluten free pasta, ground beef, your favorite pasta sauce (my slow cooker spaghetti sauce works great), ricotta cheese, olives, and cheddar cheese. You can jump behind a recipe like this, right? First time I made this recipe I was like I NEED TO CLEAN OUT MY FRIDGE AND PANTRY! So I found all of the above mentioned things in my fridge and pantry. No doubt I could whip together a delicious recipe with said things. Woot there it is. I made that recipe right up there – easy gluten free pasta casserole. You may think it’s a weird combo. Who the heck eats kalamata olives with cheddar cheese? This gal right here does and I know you will too because you’re going to try this recipe for dinner tonight, right? And then you’ll eat it for dinner tomorrow night too because a big ol’ 12×8 pan makes for a giant amount of gluten free pasta casserole. No complaints here, no complaints with you either, right? Cook the ground beef in a large pot or skillet. Mix in the pasta sauce, ricotta cheese and olives. Pour into a 12x8x2 baking dish (or any equivalent sized dish) and sprinkle with cheddar cheese. Broil for 5 minutes or until the cheddar cheese is melted. This looks really delicious! A lot less fuss than making lasagna. 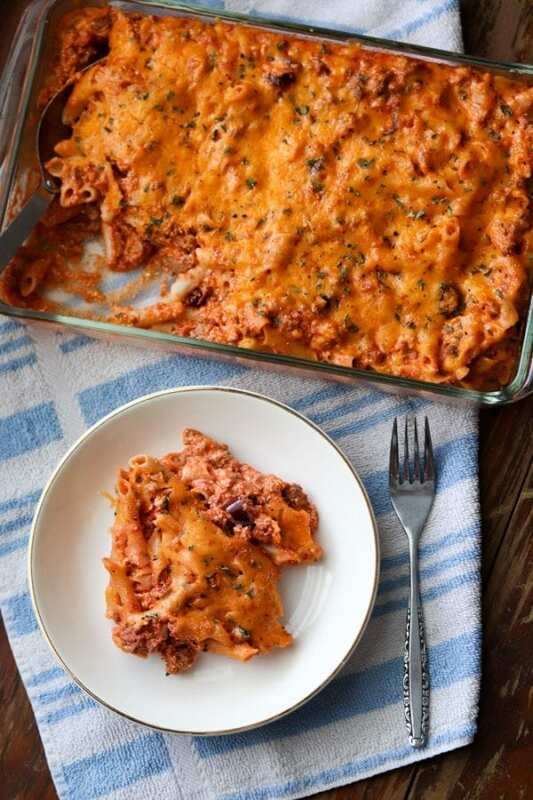 Penne pasta casseroles are our favorite around here. Kalamata olives is a nice kick to the recipe. This looks so good! Thanks for sharing.wonderful! Yum! This pan would be licked clean at my house! good idea for a quick dinner. Pasta is so versatile, this is a great combination. I love pasta, it’s my favorite for sure! Combine it with beef and I’ll go crazy over it, thanks for sharing! 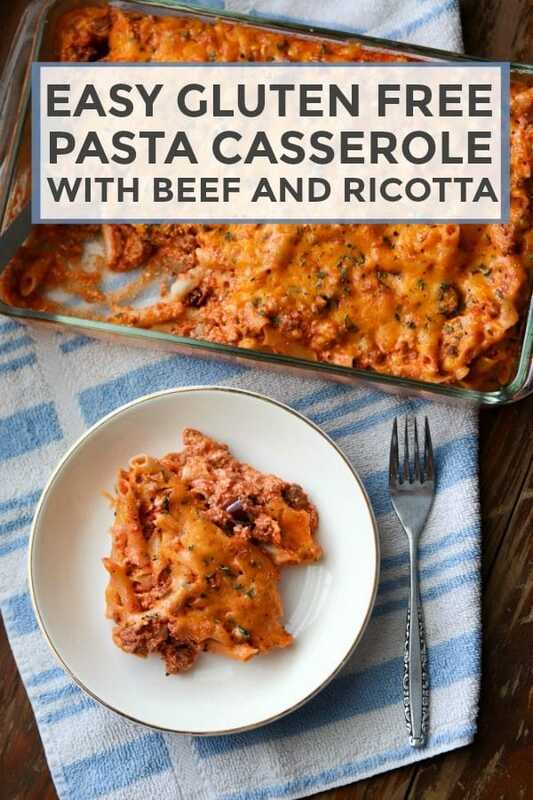 Your awesome Beef Ricotta Pasta is making me hungry! Thanks so much for sharing with us at Full Plate Thursday,we are so happy to have you join us. Have a wonderful week and come back to see us real soon! 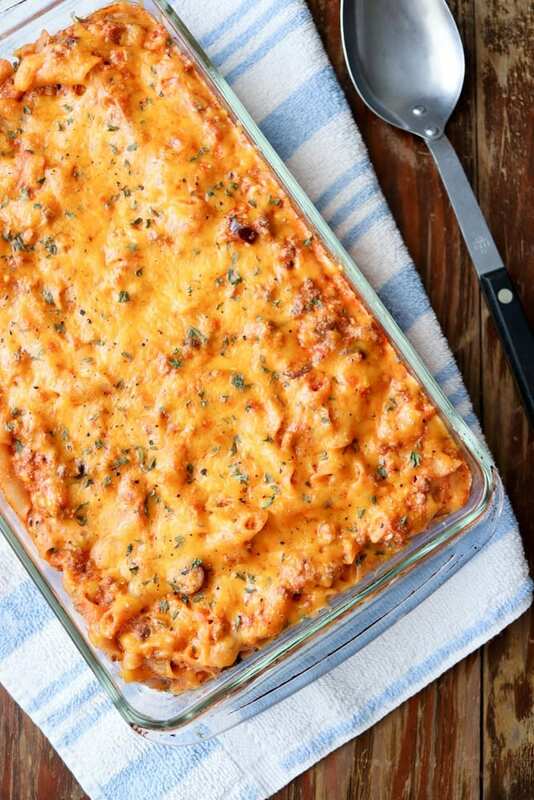 Nothing says cooler weather like a delicious casserole – this one sure fits the bill! Thanks for sharing at the What’s for Dinner party! Can’t wait to try this recipe. I know my family will love it. Thanks for sharing at the Inspiration Spotlight party. Pinned & sharing. Epic fail. Directions are false. Would you mix all ingredients and then put under the broiler to heat the whole thing up? I ignored that, but it still was so bland…No one ate it. All wasted ingredients. Into the garbage. Broiling is to melt the cheese. As per instructions, the beef is cooked, pasta sauce, olives and ricotta are added to the ground beef (which is hot), then cheese is added. Broiling is simply to melt the cheese. You could eat the meal without broiling, since it’s hot. We loved this recipe – so much that I’ve made it more than once. Sorry it didn’t work for you.